TRAIL-A-BOOT trailers are more than just your average trailer. With a fully weather-proof and lockable lid, they let you carry your belongings with complete peace of mind, knowing that your cargo is safe from the elements as well as from thieves. Stylish and streamlined, they're perfect for transporting anything you'd like to take in your car, but simply can't fit in. And with their unique compact design, there's no need for them to get in your way at home when they're not being used ... because they stand on their end under a standard carport! 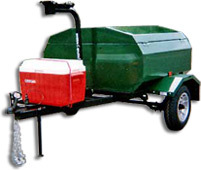 With the extra protection they provide, TRAIL-A-BOOT trailers are extremely versatile. Use them to store your tools for easy access while on-site, and save time loading and unloading. Or pack the camping and fishing gear for all your family and friends on your next holiday, without running out of room or filling up the rear-view window so you can't see out. Stow your luggage away from the dust and dirt of the road, transport your products between meetings with clients and buyers ... even transport your model airplanes to meetings in safety! The range of uses to which these trailers can be put is limited only by your imagination. 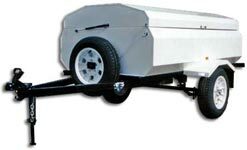 Each TRAIL-A-BOOT trailer is fully customizable, so if none of our standard sizes suit your needs, we're happy to make one to your dimensions. Choose from a range of colors, as well as from the extensive range of options we offer to fully fit your trailer out for its intended purpose. Information about the system and all its options can be found in the different sections of this site, which can be accessed through the navigation buttons on the left. Seeing is believing, though, so be sure to check out our gallery, which contains an extensive collection of images of models we've already built. See for yourself how Trail-a-Boot can work for you, and how it can be used to enhance your business or leisure pursuits. We also manufacture Stretchpack, a unique conversion system which adds carrying capacity to your ute, van or small truck through the addition of a lazy-axle. Click on the Stretchpack image on the left to be taken to that area of our website for more information. If there's anything further you'd like to know, please don't hesitate to contact us personally. Call or fax us at the numbers listed on our contact page, or email us with your questions and we'll get back to you as soon as possible. Please report any problems with the site to our webmaster.